Paris Airport Bars Muslim Staff. More than 70 Muslim workers at France's main airport have been stripped of their security clearance for allegedly posing a risk to passengers. 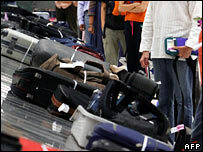 The staff at Charles de Gaulle airport, including baggage handlers, are said to have visited terrorist training camps in Pakistan and Afghanistan. Can you believe the USAF has had the F-117 Nighthawk in service for 25 years already? That blew me away! I really can't see our current fleet filling in it's shoes, but what do I know! The FAA said "no" and slammed the door on any further consideration. It won't budge on the medical "Catch-22" issue or extending the driver's license medical to pilots exercising recreational pilot privileges. Last June AOPA petitioned the agency for changes to allow more pilots back in the air. "But we won't give up, particularly because we think the FAA's position is logically inconsistent," said Andy Cebula, AOPA executive vice president of government affairs. "Too many healthy pilots have lost their medicals, yet they could still fly simple aircraft like Cessna 172s safely. We're going to find a way to make that happen." AOPA has petitioned the FAA multiple times to extend the "driver's license medical" to recreational pilots. That would allow pilots to fly a fixed-gear, four-seat aircraft with up to 180 horsepower in day-VFR conditions without a medical certificate. When AOPA has made this request in the past, the FAA has said there wasn't enough data to show that the change could be made safely. This time the FAA's answer was to simply close the door. "The FAA has not found cause...to reconsider the third-class medical certificate standard for the exercise of recreational pilot privileges," the agency said. "But we will keep knocking on this door," said Cebula. AOPA will conduct yet another detailed analysis of the data records, looking specifically at the two years of data from sport pilots flying without medical certificates. "We'll hit them again with the evidence," said Cebula. "The FAA recognized that it could be done safely for sport pilots. Sooner or later, we will convince them to extend the logic to other pilot certificates," Cebula said. AOPA had also suggested a common-sense way to fix the Catch-22 for sport pilots. Every pilot exercising those privileges in light sport aircraft don't need a medical certificate, just a current driver's license. Everyone, that is, except a pilot who has previously been denied a medical certificate by the FAA. They can't fly, even though someone else who has the same medical condition — but hasn't ever applied for a medical certificate — is legal to fly as long as they are healthy enough to drive. AOPA said that an AOPA member should be allowed to obtain a health statement from his personal physician declaring that he is healthy enough to operate a moving vehicle and is not likely to suffer any kind of incapacitation within the next 24 months. But the FAA said that might "place licensed physicians in the position of unwittingly declaring someone fit for flight." The agency said the idea was "too difficult to implement." "We won't give up on this issue either," said Cebula. If you ever find yourself at a loss for words when trying to explain to a "ground pounder" why we fly, show them this. Or if you just want to remind yourself, take a look at this photo essay from two brothers who say they're just "happy bozos" lucky enough to fly. In a cross-country trip in a Maule from California to Oshkosh and AirVenture, they captured incredible images of things only pilots can see. The US Navy began a series of ceremonies on Thursday to celebrate the F-14, as the pilot favourite that served on aircraft carriers for three decades heads into retirement. 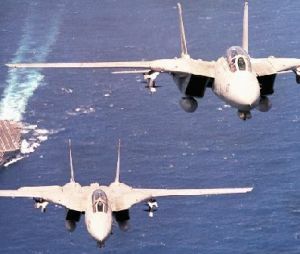 The last of the F-14 Tomcats still in service were being flown at Oceana Naval Air Station in Virginia as part of the goodbye ceremonies that would last into Friday, a Navy spokeswoman said. The fighter jet was made famous by the 1986 film Top Gun starring Tom Cruise, but was more recognized by pilots for its speed, versatility and ability to carry a broad array of weapons. First flown in 1970 and introduced to the Navy’s fleet in the middle of that decade, F-14s were involved in confrontations with Libya and saw action in Lebanon, the first Gulf War, the Bosnian wars, Afghanistan and the second war with Iraq. The F-14 features an adjustable sweep wing, two engines and can reach speeds above Mach 2 using powerful afterburners. The wing could be swept all the way back for flying at high speeds and forward to increase manoeuvrability in dogfights. The F/A-18 Hornets have been gradually replacing the F-14s as the Navy’s main fighter since the early 1990s. The F-14 was manufactured by Grumman Aerospace, which merged with Northrop Aircraft in 1994 to become Northrop Grumman.